I’ll confess: I’m a hoarder. I’ve been known to keep mascaras for a year after their expiration dates “just in case”. Recently I decided to reorganize my make-up so I also tested each product and got rid of anything that seemed old or used up. Therefore a lot of these empties are not entirely empty, but rather products that I’m done with. It’s safe to say I squeezed every last drop out of this bottle. This shower gel smells absolutely amazing and hydrated my skin very well for the price! I haven’t repurchased this as I have about ten mini bottles of shower gel to get through, but I probably will in the future for the coconut scent alone. This is one of the mascaras that I kept long past its due date. I liked this product for providing length and volume, but probably not enough to repurchase it. I can’t remember when or where I bought this, so it wasn’t a surprise to me that this had dried up! I remember it being a fairly good liquid eyeliner so I might repurchase it in the future. The felt tip applicator is really nice but the wand is a little bit short! I’ve dropped this so many times, which is probably the reason why most of the product is gone. This was a nice shimmery bronzer and it was only $1 so I do recommend it! The product isn’t completely gone but the packaging is broken and it was just taking up space that I didn’t have. 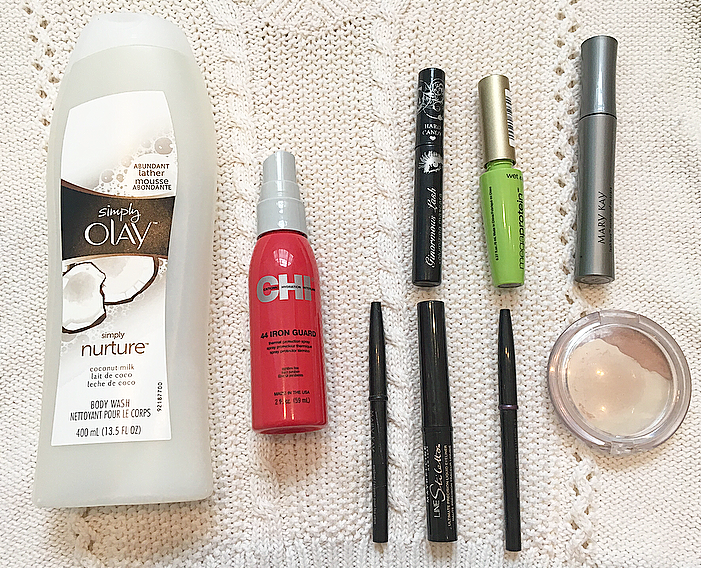 If you’d like to see why I disfigured these mascaras there is a post here! The wand is from a Stila sample that I absolutely loved and the base/formula is from a Wet n’ Wild mascara. I got a few extra months use out of it before it dried up and I’ve decided to retire it. My aunt gifted me a set of Mary Kay eyeliners in various colors last Christmas. Most of them are still nice and creamy, but these two started to tug at my skin so I’m getting rid of them. I got a lot of use out of the black one and the purple one is nice when I’m doing a purple smoky eye! I’d always hear nice things about CHI as a brand, so when I found this brand new bottle at a garage sale I snatched it up! Given the size, it lasted me a very long time. I decided to try a different heat protectant spray but this one worked well! There’s not much to say about this product. It wasn’t terrible, but it wasn’t great, either. If I really like a mascara I will usually keep the tube in case I want to include it in a blog post, but I’ll be getting rid of this one. I’ll try to do empties posts every couple of months or whenever I have a good amount of empty products! It’ll also keep me from hoarding old make-up so it’s a win-win for everyone! Are you a make-up hoarder? 21 comments on "April/May Empties and Reviews"
I haven't tried any of these but the Olay body wash sounds lovely! I really like their lip products, eyeshadows, blushes and some of their skin care! The eyeliners probably aren't worth the money to be honest, they're really small and dry out quickly. These makeup products look awesome. I've never tried anything from elf but their products sound great! I really recommend them, some things can be a bit hit or miss but overall the quality is great for being so affordable! Thank you! I love your blog name by the way!